Make sure all services are started and running in Mail services status section. Check Reverse DNS in Network setting status section. Check MX record in Network setting status section. Check SPF record in Network setting status section. Check Spamhaus ZEN in Network setting status section. 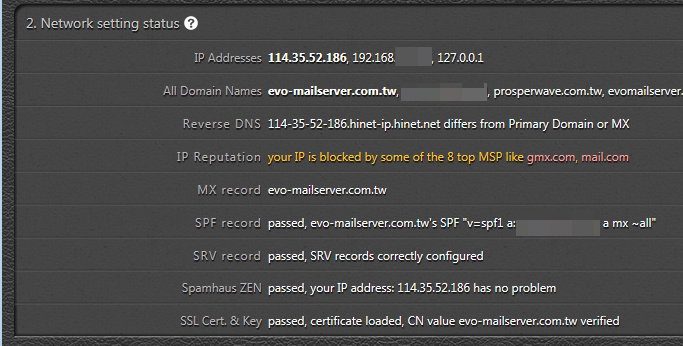 IP Reputation – EVO Mail Server sends query to 13+ IP reputation services and displays results here. If some of the services shows in yellow color, then click on it to find out how to resolve issues. SRV record – If it shows SRV record is missing, then check with your DNS hosting services and see if supports SRV record. First create an e-mail account on EVO Mail Server. Log on a valid Gmail account. Send an e-mail to the e-mail account that was created earlier. Check Mail Log to see if e-mail message came in. Open a mail client software. In the software, configure the e-mail account created on EVO Mail Server accordingly. Be sure to enter username, password, mail server host name, enable SMTP Auth. Use Port 25 for non-SSL SMTP, Port 110 for non-SSL POP3, Port 143 for non-SSL IMAP. Use Port 587 for TLS SMTP, Port 995 for SSL POP3 or Port 110 for TLS POP3, Port 993 for SSL IMAP or Port 143 for TLS IMAP. Once account is configured, check if e-mail message came in. Simply reply the incoming e-mail message on mail client software. Check Mail Log to see if e-mail message is being delivered. Go back to Gmail on the browser. Check if new e-mail message comes in from reply in Step 4.